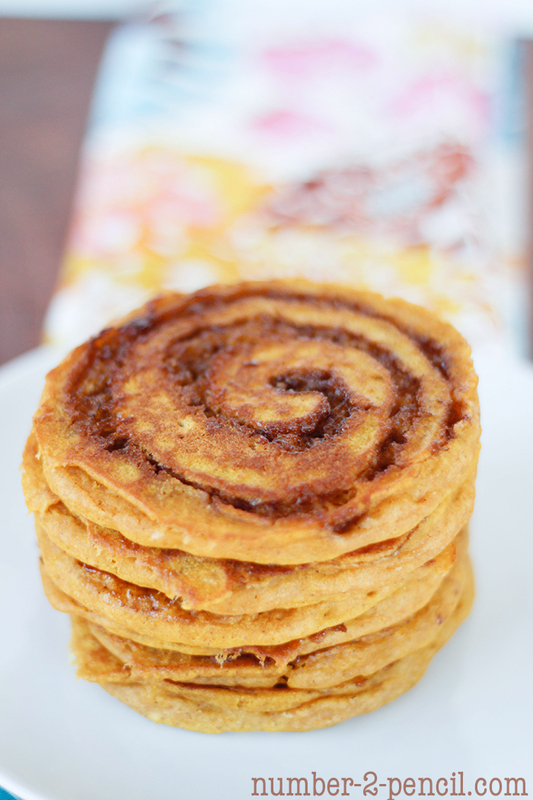 This recipe for Pumpkin Cinnamon Roll Pancakes has quickly become a family favorite. 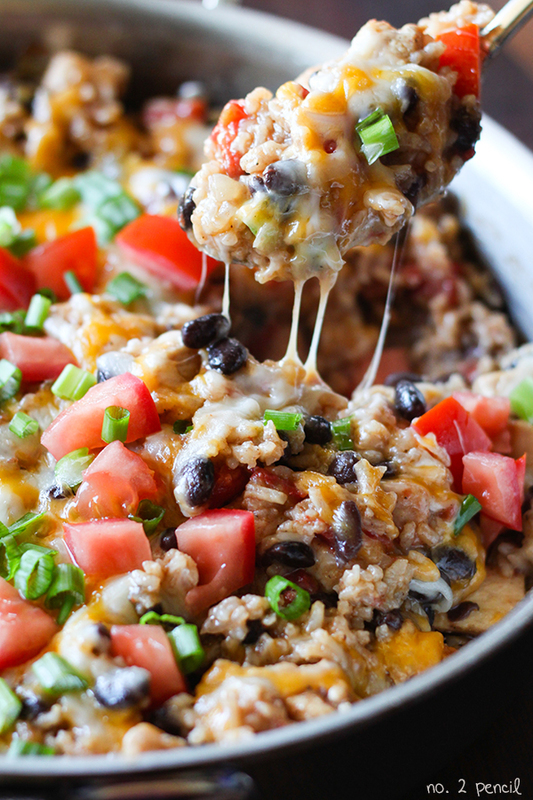 They are the perfect breakfast for fall. 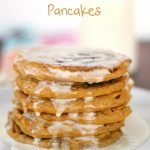 Tender pumpkin pancakes with a buttery, cinnamon swirl, topped with a decadent cream cheese glaze. I know your family will love these as much as mine does. Step 1: Preheat electric nonstick griddle to about 325 degrees. Step 2: Prepare cream cheese glaze, and set aside so it is ready to be poured on the piping hot pancakes. Step 3: Prepare the cinnamon swirl mixture by stirring together softened butter, dark brown sugar, and cinnamon. Transfer the mixture to a disposable piping bag or a plastic baggie, and snip off the end. Step 3: Prepare the pumpkin pancake batter and pour it onto the hot griddle using a 1/4 cup measuring cup. Step 4: Let the pancakes cook for about one minute; they will start to set up just slightly. Then use the piping bag to gently swirl the cinnamon mixture into the pancakes. Important note: You want to use the tip of the bag to push slightly into the batter so the cinnamon mixture is swirled into the batter, not just on top of the pancake. Keep the swirl close to the center of the batter so the mixture doesn’t melt off the side of the pancakes. Step 5: After about eight minutes, or when the edges start to look done, use a wide spatula sprayed with nonstick cooking spray to flip the pancakes. They will take on this gorgeous golden color. Step 6: Cook for about five more minutes, and then serve to your lucky family. Between batches, remove any butter and sugar left behind by carefully cleaning the hot griddle with damp paper towels. Serve with hot maple syrup, or the perfect cream cheese glaze. The best part is, they taste even better than they look. My family went crazy for these pancakes, and I know yours will too. Preheat electric nonstick griddle to about 325 degrees. Prepare cream cheese glaze, and set aside so it is ready to be poured on the piping hot pancakes. Prepare the cinnamon swirl mixture by stirring together softened butter, dark brown sugar, and cinnamon. Transfer the mixture to a disposable piping bag or a plastic baggie, and snip off the end. Prepare the pumpkin pancake batter. In a large bowl, combine flour, sugar, baking powder, baking soda, cinnamon, and salt and whisk together. Add wet ingredients to dry ingredients and stir just until combined. Pour onto the hot griddle using a 1/4 cup measuring cup. Let the pancakes cook for about one minute; they will start to set up just slightly. Then use the piping bag to gently swirl the cinnamon mixture into the pancakes. Important note: You want to use the tip of the bag to push slightly into the batter so the cinnamon mixture is swirled into the batter, not just on top of the pancake. Keep the swirl close to the center of the batter so the mixture doesn't melt off the side of the pancakes. After about eight minutes, or when the edges start to look done, use a wide spatula sprayed with nonstick cooking spray to flip the pancakes. Cook for about five more minutes, and then serve. Between batches, remove any butter and sugar left behind by carefully cleaning the hot griddle with damp paper towels. In the bowl of a stand mixer, beat cream cheese, vanilla and powdered sugar together until well combined. Add heavy cream and mix. If mixture is too thick, add a splash of milk to get to a pourable consistency. 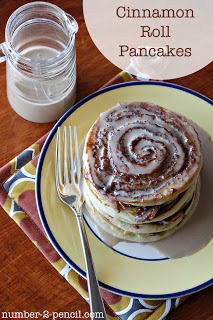 These pancakes where inspired by my popular recipe for Sour Cream Cinnamon Roll Pancakes. 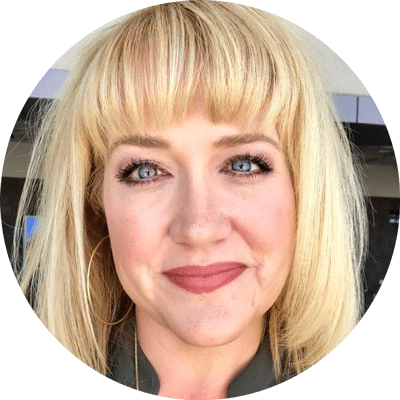 I’d love for you to keep up on my new posts and recipes. You can follow me on Facebook and Twitter. You can also find me on Pinterest, that’s my favorite place to hang out and I’d love to see you there! 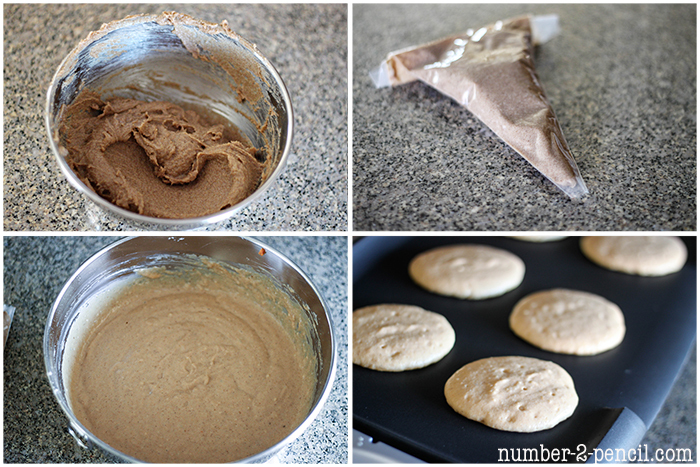 I originally shared this recipe on September 20, 2012 as a guest post on I Heart Naptime. Thanks again Jamielyn for letting me share! Oh my gosh … that cinnamon swirl is killing me! 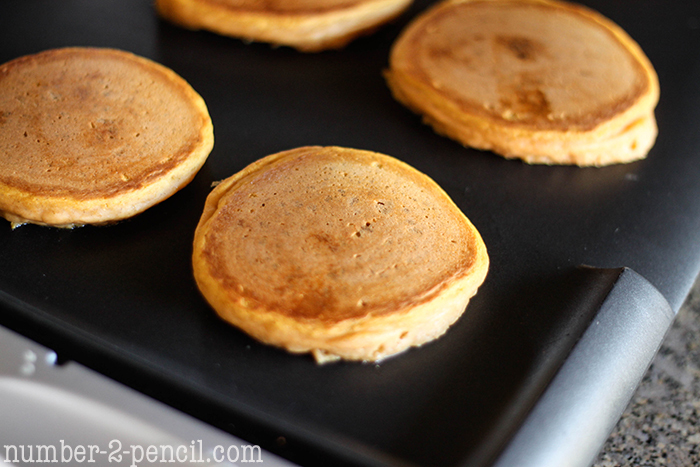 I have a pumpkin pancake mix that I am going to have to doctor up with the swirl and glaze 🙂 Pinned! These are making me drool! This must go on my list of things to make this weekend. Yummo! Oh my!! I know my family would just die over these. Yum! 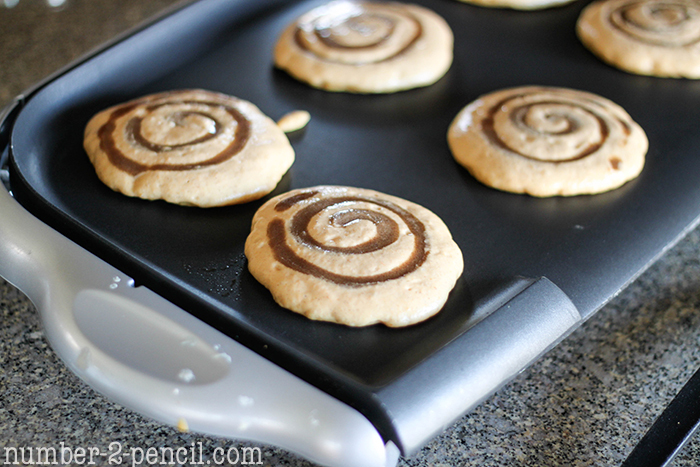 Mm,I love cinnamon roll pancakes! 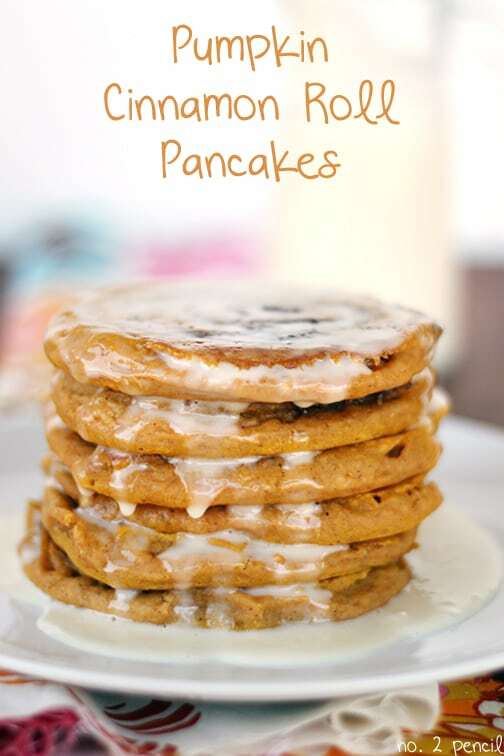 Pumpkin, cinnamon rolls, and pancakes – three of my favorite things! Yummy! Oh, my ever-loving stars! Those look soooo amazing! I love making cinnamon rolls, but pancakes are our fav… both together and I might die and go to pancake heaven!!! We are gluten free, so I’m wondering if this will work with almond flour… I think I’ll try it on Saturday… nothing to do this weekend, so I think it’s time to celebrate that alone! omg if these taste even half as good as they look… a part of me really wants to try them, but the wise part of my brain is telling me that i may not want to sleep in the gym this winter.